In this unit you will learn more fretted notes on the fourth string, sixteenth rhythms and dotted-eighth rhythms. You will also learn how to applied these rhythms in both simple and compound meters. ‘D♯’ and ‘E♭’ are enharmonics. To play ‘D♯’ or ‘E♭’, fret the first fret on the fourth string. ‘F♯’ and ‘G♭’ are enharmonics. To play ‘F♯’ or ‘G♭’, fret the fourth fret on the fourth string. You already learned to read this note as the open third string. However, this same pitch can be played as the fifth fret of the fourth string as well. 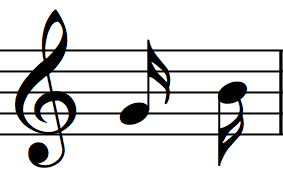 In simple meter, a sixteenth note sustains for one-quarter of a beat. The sixteenth note can be written in two ways: either with two beams or two flags. Four sixteenth notes are written here. The sixteenth note consists of a note head that is colored in, a stem and two beams. In this example, the beam connects four sixteenth notes. Four sixteenth notes add up to one quarter note. 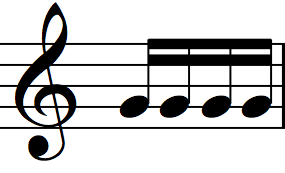 In this example, the sixteenth notes contain flags instead of beams. A sixteenth rest creates silence for one-quarter of a beat. The sixteenth rest consists of a diagonal line with two small flags. The first sixteenth receives a number, which represents the beat’s placement in the measure. The second sixteenth receives the sound ‘ee.’ The third sixteenth receives the word ‘&.’ The fourth sixteenth receives the sound ‘ah.’ When you play music with sixteenth rhythms, I suggest you count with “1e&a…” throughout the entire piece, even when you encounter eighth, quarter, half and whole note rhythms. This will help you maintain a steady beat. 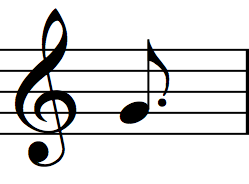 The dotted eighth note sustains for three-quarters of a beat. 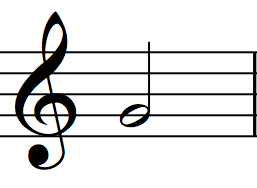 The dotted eighth note consists of an eighth note with a dot positioned close to the notehead. The dotted eighth rest creates silence for three-quarters of a beat. 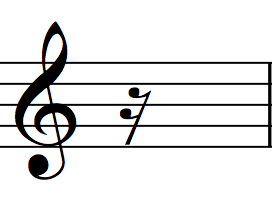 The dotted eighth rest consists of an eighth rest with a dot positioned close to the symbol. Since the dotted eighth holds for three-quarters of a beat and the sixteenth holds for one-quarter of a beat, they frequently beam together to form a group that adds up to one beat. 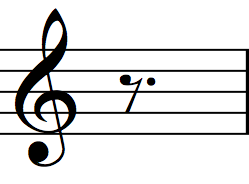 The example above shows two combinations that frequently appear in music. Eighth notes and sixteenth notes also frequently beam together to adds up to one beat. The example above shows three possible combinations. In Unit 9 you learned that the beat in compound meter is usually subdivided into three eighth notes. Therefore, in compound meter the dotted eighth note sustains for one beat; the eighth note sustains for one-third of a beat and the sixteenth note sustains for one-sixth of a beat. Eighth notes and sixteenth notes frequently beam together to form groups that add up to one beat. Here are three possible combinations. The score is a like map that leads you as an explorer to the site of musical treasure. Once there, you have to dig deep into the notation to unearth musical gems. Some composers are explicit about the type of musical treasure they want you to find. For example, in this series, Mark Popeney, Bahaa El Ansary and Ashraf Fouad are detailed and precise about dynamics, ornaments and articulations. As a classical musician, I strive to achieve the composer’s vision by playing all the notations on the score. I encourage you to do the same. However, it is important to note that some composers deliberately create scores free of extra notations. Typically, these composers entrust you to add dynamics, ornaments and articulations according to your artistic sensibility. It helps to know the composer’s influences or understand the genre’s stylistic features. For example, Brandon Mayer’s compositions suggest a bluegrass aesthetic and Emile Porée’s pieces evoke a jazz style. Throughout this series, you are welcome to play on any type of guitar you choose (nylon string, steel string, electric, etc.). However, if you would eventually like to perform this next piece, please note that the composer recommends using a steel-string guitar. Cueurs Desolez Par Toutes Nations is ultimately meant for voice with guitar accompaniment. However, the vocal part is perfect for your guitar sight-reading practice. Please play the vocal part on your guitar and if you like it, try singing along! Process I is a great piece for sight-reading variations on sixteenth rhythms. However, you may want to approach this piece a bit differently from the others on account of a few issues. The main issue is that the MIDI Guitar 2 audio (below) contains tremolos that sound more like technical glitches than actual guitar tremolos (note that a real Guitar 2 part will be added eventually). If the Guitar 2 part is too distracting, you may want to simply play Guitar 1 along with a metronome click. The secondary issue is that the piece is long. I suggest you sight-read the rhythms on one pitch first and then sight-read the whole piece (or a significant section of it).